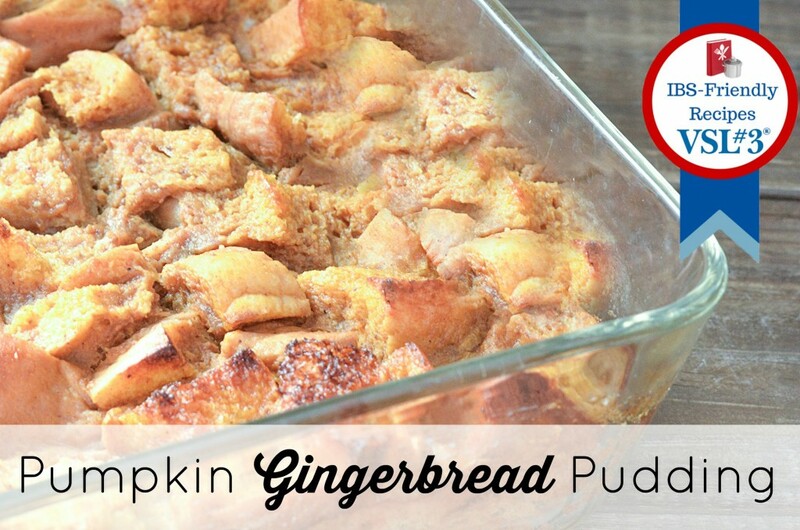 This Pumpkin Gingerbread Pudding recipe is a partnered post on behalf of VSL#3. As we enter into the holiday season, even those with the best of intentions are tempted by all of the delicious foods that surround us during this time. For some these temptations and overindulgence may mean gaining a few extra pounds in the last month of the year but for others, there may be health issues that are aggravated by the influx of rich, decadent foods. This year I want to be a little more cognizant of the foods I eat and while they aren’t going to be healthy, with a little effort I think I can keep tummy upsets to a minimum. 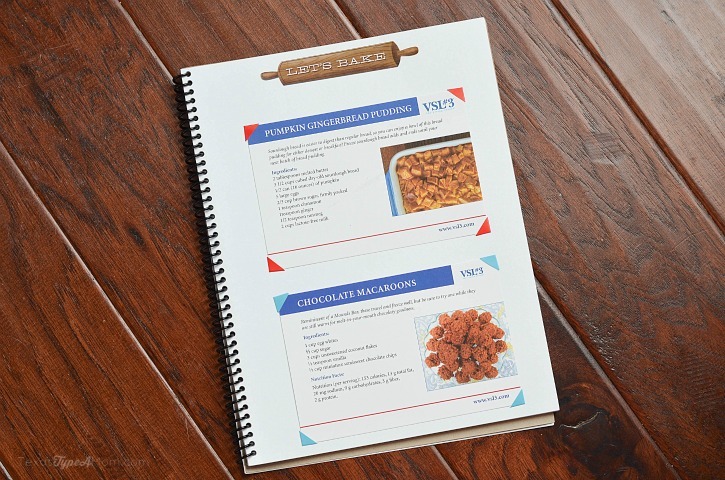 The kind folks at VSL#3 sent me a blank book along with some recipe cards so that I could assemble my very own IBS-friendly recipe cookbook. Of all the recipes I was sent, the Pumpkin Gingerbread Pudding really caught my eye. I love pumpkin gingerbread and it’s our family tradition for breakfast on Thanksgiving morning, but this recipe sounded like it may give my pumpkin gingerbread a run for its money. Grease a 7 x 10-inch pan heavily with the melted butter. Distribute cubed bread into the pan, and set aside. In a medium-sized mixing bowl, combine the remaining ingredients stirring in the milk last. Pour pumpkin mixture over the cubed bread and allow the bread to soak up the milk mixture for about 10 minutes while the oven preheats. Bake until a little puffy in the middle and golden brown around the edges, about 55 minutes. Cool for 20 minutes then serve warm, with vanilla ice cream. In addition to the cookbook, I was also sent a sample of VSL#3. I’d been meaning to start using a probiotic and liked that this one is 10 times more potent than the average probiotic and a proprietary formulation of a mix of 8 strains of live lactic acid bacteria making it one of the few probiotics with this many strains. I’m all for efficiency and this seems to deliver. I haven’t noticed a significant difference in my tummy symptoms, but they haven’t gotten worse either. I’m eager to see how VSL#3 will hold up after Thanksgiving dinner – I have high hopes! *Harris Poll conducted the GI Issues Survey on behalf of VSL#3. The survey was administered online within the United States between April 1-7, 2015 among 607 adult’s ages 18+ who have been diagnosed with a digestive or gastrointestinal condition, irritable bowel syndrome, or ulcerative colitis, ileal pouch/pouchitis (“sufferers”). This is a product-provided, sponsored conversation that contains affiliate links. All opinions, text, and experiences are my own. VSL#3® is a high-potency probiotic medical food for the dietary management of IBS, UC and ileal pouch and must be used under medical supervision. These statements have not been evaluated by the FDA. The product is not intended to diagnose, treat, cure or prevent any disease.